I have a headache. Not a real headache, where my head actually hurts. Just a virtual headache, where I complain about stuff to anyone who will listen. While this isn't going to be a litany of complaints, you'll soon get an idea of why the transition from the REMstar 50 Series CPAP devices to the REMstar 60 Series CPAP devices has been a little problematic. I'll address some common questions that have arisen about the newer 60 series CPAP machines. While I hope the engineers and marketing folks at Philips Respironics read my observations, I'm sure they're already well aware of the logistical problems they've created with the 60 Series machines. Don't get me wrong. 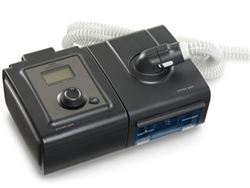 The PR System One REMstar 60 Series devices are excellent CPAP machines. The best model lineup for Philips Respironics to date. So there's nothing at all inherently wrong with them. The problem is the transition from the previous model to the newest model, and the wreckage left in the path of that transition. Why the transition? Philips Respironics needed a model line that supports a heated tube, and they apparently couldn't make that happen with the existing 50 Series. As a result of the transition, the two System One model lines (the 50 Series and the 60 Series) are incompatible in several ways, so parts for one don't work with parts for the other. It's important to know how to tell the difference between a 50 Series and 60 Series PR System One REMstar machine. If you have a REMstar with a number like 150P, 250P, 450P, 550P, 650P, 750P, etc. then you have a 50 Series device. If your number is 260P, 460P, 560P, 660P, 760P etc. then you have a 60 Series machine. Note that as of this writing there is no 160P device. These are the markings on the bottom of the machine. The actual manufacturer part numbers are like DS150S, DS250S, DS260S, or DS460S. The 60 Series machines can also be identified easily by the charcoal and dark silver two-tone color scheme. The older 50 Series has a charcoal and light gray color scheme. Let's look at some specific examples of problems created by the model line transition. Knowing this might just save you from ordering the wrong item from our website. If you plan to use your PR System One REMstar with a battery, you can buy a 12V cord designed for your machine. Just be sure to get the correct cord, because the DC input jack on the newer 60 Series is much bigger than that on the 50 series devices. If you have the 12V cord for any of the previous REMstar models (the same 12V cord has worked for all REMstar models available over the last decade), that cord will not work with the 60 Series machines. The new cord is basically the same, but with a different size connector. Reminds me of the cell phone accessory scheme. I had a Verizon car charger and then when I switched phones I had to buy the same exact charger again, but with a different connector. I'm sure you've experienced the same thing if you've ever bought more than one model of cell phone. Frustrating, to say the least. What? Two different power supplies for the 60 Series? Yep. That's right. Two. No problem, really, except that for different "kits" come with different power supplies. Ugh. I think this is the issue that bothers me the most. Instead of including the 80W power supply with all kits (i.e. no matter if the machine kit includes a heated tube humidifier), the kits that consist of the flow generator alone (like DS260S) or the flow generator with regular heated humidifier (like DS260HS) include the 60W power supply. If you upgrade to a heated tube humidifier, then you need to buy a new 80W power supply to go with it. The phrase that comes to mind here is "LOWEST COMMON DENOMINATOR". Philips Respironics should embrace the term next time the issue presents itself. I really do understand that a smaller, lighter power supply should be made available as an option to people who think the 80W power supply is too bulky (although there's a minimal difference between the two in terms of size and weight). But the smaller power supply should be an option only. This is the path ResMed took in offering two different power supplies, and I think it was the right choice. Much less confusion for CPAP users. Check the links above for the 60 Series 60W and 80W power supplies. Say it isn't so. That's the first thought that came to my mind when I learned that the 60 Series humidifiers were not compatible with 50 Series flow generators. What more can be said about it? Just be careful when ordering a System One humidifier if you already own a System One machine. Oh the humanity! Seriously? Two? This is wrong on so many levels - from manufacturer production, to dealer inventory, to customer service and marketing efforts. Ideally, there would be a single System One humidifier that supports both a regular tube and a heated tube. ResMed would have been a good model to follow here. Instead of the ideal situation though, the manufacturer must handle more inventory, dealers must buy and store more inventory, and customers must choose between two products instead of getting a single product that handles both applications. The only bright side to this issue is that there's a conversion kit available to transform the standard humidifier into one that supports the heated tube. But it's not a super bright side because it means more inventory and more potentially confusing choices for the consumer. Check the links above for the two different humidifiers. One supports a regular tube and one supports a proprietary heated tube. But wait! There's more! (I know. Now I'm just being facetious.) 60 Series machines don't work with the EncoreViewer 2.0 software. The newer models only work with Encore Pro version 2.11 or later. Dealers aren't supposed to sell Encore Pro to CPAP users, so it's a bit of a problem if you want easy access to the data recorded by your CPAP machine. We got that question a few times soon after the release of the REMstar 60 Series. Philips Respironics used to provide cover plates with the 50 Series kits that included a humidifier, knowing that it would be likely for a CPAP user to remove the humidifier to use the CPAP flow generator by itself from time to time. With the humidifier removed from the flow generator, the cover plate is generally installed on the side of the flow generator to make it look nicer. With the 60 Series, though, the manufacturer decided to leave the cover plate out of the kits which include a humidifier. So, when you remove the humidifier, your CPAP machine looks kind of, well... ugly. We're including the cover plates at no charge with any kit that comes from the manufacturer without the cover plate, so you don't need to worry too much about this issue when you buy from us. However, if you purchased your machine elsewhere and didn't get a plate, we'd be happy to sell one to you for a nominal charge. Perhaps most confusing to customers is the fact that each new REMstar model is available in three different kits, as outlined below. Kit ending in S: flow generator, 60W power supply, standard tube. Example: DS260S. Kit ending in HS: flow generator, heated humidifier, 60W power supply, standard tube. Example: DS260HS. Kit ending in TS: flow generator, heated tube humidifier, 80W power supply, heated tube. Example: DS260TS. It appears the transition from 50 Series to 60 Series was a difficult one for Philips Respironics, as they made changes to their devices to compete with rival ResMed. Perplexing incompatibilities aside, the end result of the transition is a fantastic CPAP machine. I hope this article helps you to find the right products for your machine, without making any of these issues more complicated or confusing than they need to be. As I finish writing this I'm helping a customer on a live chat on our web site, and he's asking about the different 60 Series models because he's confused about the difference between the DS260TS and DS260HS. His assumption is that the two kits are the same, but one comes with a heated tube and one doesn't. But that's not accurate. The DS260TS includes an 80W power supply, the special humidifier that supports the heated tube, and the heated tube itself. The DS260HS includes a 60W power supply, the standard heated humidifier with no support for the heated tube, and a standard tube. I think I'll send him a link to this article. Back to work I go. Call with any questions. We're here to help.